← How to convert WMF to raster BMP? To convert scanned PDF to Excel file, you may need to use a kind of document converter which is able to convert PDF to Excel file, also able to accurately recognize the characters in scanned PDF document. So the application VeryPDF PDF to Excel OCR will be the right one after you search for the tool on Google. With the awesome OCR technology, the application PDF to Excel OCR Converter can recognize six kinds of languages: English, French, German, Italian, Spanish and Portuguese. So you don’t need to worry about whether PDF to Excel OCR Converter is able to recognize your Portuguese PDF document. Of course it is! If you want to download the application for using it, please get into its homepage. You can click “Download” button to download a free trial version of the application to your computer. Then you need to double click the setup file and follow the installation wizard to install the application. In this procedure, you can create a desktop icon for the application so that you can open it conveniently. Then please see the conversion process in the following contents. 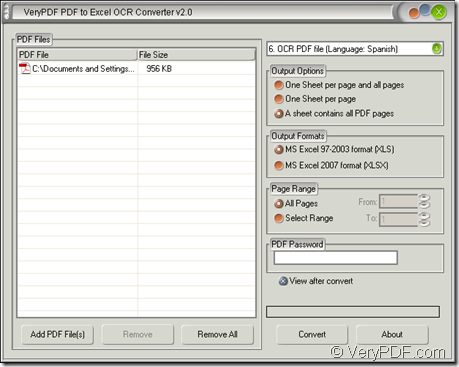 Click “Start”—“All Programs”—“VeryPDF PDF to Excel OCR Converter v2.0”—“VeryPDF PDF to Excel OCR Converter v2.0”. 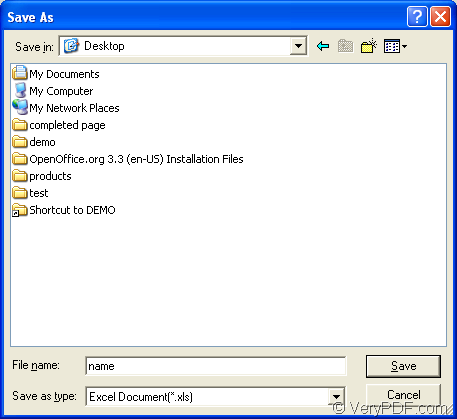 Open installation folder of PDF to Excel OCR Converter and double click the file winpdf2excel.exe. Double click application icon if you have created one. Right click the icon and click “Open” option in dropdown list. There ways are for your reference. Click “Add PDF File (s)” button to open file picker window from which you can choose the document you want to convert. Right click file list and click “Add files” option in floating item to open the same file picker window. Drag the document and drop it into file list. You need to make several settings for the target file. Choose “OCR PDF file (Language: Portuguese)” option in top right dropdown list. Choose one output layout in “Output Options” group box. Choose one output format in “Output Formats” group box. Set page range for input Portuguese PDF document in “Page Range” group box. Input the open password of the input PDF document if it is an encrypted one in “PDF Password” edit box. Please click “Convert” button to open “Save as” dialog box. Choose output location in “Save in” dropdown list. Input name for target file in “File name” edit box. Click “Save” button to run the conversion from scanned PDF to Excel. Now please see the main interface of PDF to Excel OCR Converter in Figure 1 and “Save as” dialog box in Figure 2. 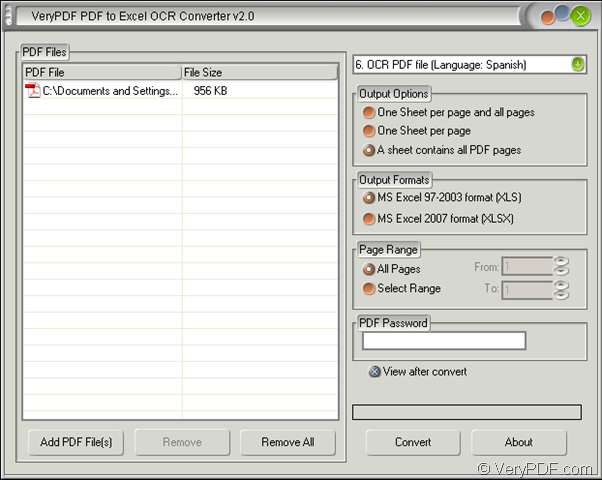 To learn more functions or features of the application, please enter the homepage of PDF to Excel OCR Converter. This entry was posted in OCR Products and tagged Portuguese PDF, scanned PDF to Excel. Bookmark the permalink.